A Dental Implant Crown is a crown (or "cap") that replaces a missing tooth, and it is held in place by a dental implant that is buried under the gum.The crown is the visible "tooth" that you can see. It is similar to a normal dental crown (or "cap"), except that it sits on a man-made dental implant, instead of a natural tooth root. So the main difference between a normal crown and an implant crown is the way it's held in place. 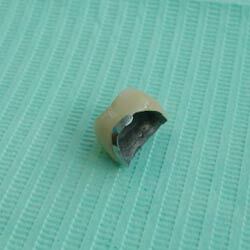 A dental implant crown sits on a dental implant, which replaces the natural tooth root. 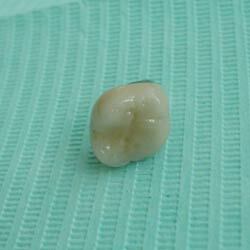 A normal dental crown sits on a natural tooth where the visible part of the tooth has been drilled down to a stump. Dental implant crowns are different in other ways too! ALL crowns are like small thimbles. They are hollow on the inside. With a normal dental crown, the top of the natural tooth will fit inside, after the tooth has been trimmed down a little by your dentist. But with a dental implant crown, that hollow space inside the crown is taken up by a precision-machined connector (also called an "abutment") made out of a gold alloy (or sometimes a ceramic such as Zirconia). The other end of the connector fits down into the top of the implant (the artificial tooth root). So the connector ("abutment") is like a small rod or peg. From a technical point of view, a crown that is held in place by a dental implant should be easier to make than a normal dental crown. The dental laboratory technician can make the precision-machined connector (abutment) to the ideal size for the final crown. With a natural tooth, the lab guy has to work with what the dentist sends him! The dentist can only grind down a natural tooth a certain amount, otherwise he may weaken it or damage the tooth nerve. This means that the stump of natural tooth left may well be a bit bulky, or at an awkward angle for the laboratory technician to work with. So, when the dental technician starts to build a normal crown to fit over the ground-down stump of a natural tooth, he may have to make some parts of the crown very thin, otherwise the crown will end up looking bulky or the wrong shape when it's fitted in the patient's mouth. This can mean that the crown ends up not being as strong as it should be, and it may be difficult to get a natural appearance. A crown on a dental implant does not have these restrictions. The technician gets a mould from the dentist showing just the top of the implant, which is just below the gum, or level with the gum. The technician can then make up the connector (abutment) any shape or size he wants. Of course, he will make it big enough to be very strong. But at the same time, he can also make it slender enough so that the sides of the final cap or crown that fits over it will be about 2 millimeters thick. (ideal for strength AND appearance). He can also angle it in any direction, if needed, to compensate for an implant that is not perfectly straight. The precision connector is then fitted into the implant in the patient's mouth, and the connector is held in place inside the implant by a titanium screw that screws through a small hole down the middle of the connector into the middle of the implant itself. The implant-supported crown can then fitted onto the top of the connector ("abutment"), and held in place either by a dental cement, or by a small screw. The crown held by cement is generally simpler, and has less chance of bacteria getting inside it. But it can be difficult to get off if the dentist needs to check the implant underneath. The crown held by a screw is easily removed by the dentist for checking and cleaning, but the screw adds complexity and may be a hiding place for bacteria. In many cases, the choice between cement or a screw is a personal preference of your dentist. There is no clear "best" choice! One other important difference between a normal crown and a dental implant crown is that the implant crown frequently has it's edges buried several millimeters under the gum. This means that bacteria can collect under the gum more easily, too, leading to peri-implantitis. This is an inflammation of the gum around the edge of the crown, where it touches the gum. To prevent this problem, I STRONGLY recommend an oral irrigator to keep the gum clean around any dental implant crown. In my experience over 30 years, I think the BEST one is the HydroFloss oral irrigator. Read more about this fantastic technology at Oral Irrigators. Also, using dental floss to gently clean under the gum around the crown will help, AND you should also use a quality electric toothbrush to remove any plaque build-up. The one I STRONGLY recommend in this situation is the Cybersonic 3 toothbrush. Read a review of this toothbrush here, AND get your HALF PRICE discount code! As you can see, a dental implant crown is usually a bit more complicated for the dental technician, but the final result should be as natural-looking as a normal or conventional cap or crown.